When owners Glen and Karen Gillingham envisioned service at Berrington, it was centered around transforming aged care. Originally nursing homes are based on a hospital model, but they knew aged care should be vastly different, and designed a comfortable, exquisitely modern environment, carefully selecting each element that would make it feel like home. Choosing their team was no different – each member of the staff is hand-picked based on their dedication to enriching the lives of residents at Berrington. You deserve to know more about who will be working with you and serving you on a daily basis. When searching for staff, our managers seek out people who don’t believe in the status quo for aged care. Instead, this select group wants to go the extra mile from the moment they step into the interview through to their entire tenure at Berrington. We believe in allowing our team members to excel and give them every opportunity to do so, ensuring that they love what they do and are passionate about our vision. One thing we value the most sounds simple, but means the world: a smile. Each of our staff enjoys interacting with our residents, shining when it comes to engaging with them and attending to their every need. 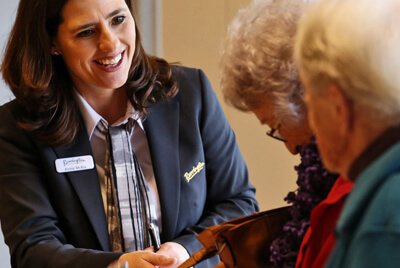 With over 300 people across both facilities, we’re proud to say that we’ve assembled the best team in aged care. Find out for yourself – we welcome you to our facilities for a tour so you can discover more about what sets us apart!